We Grow By Helping Others.Engaging Dialogue w/ Unique & Positive Individuals.Listen to Motivating & Inspiring Stories about Business & Life.Creating Lifestyle & Financial Freedom. Positive Messaging, Music, and Encouragement. Staying Positive and Promoting Faith During the Tough Times. Remember, God is in Control. Give Thanks! Daily Inspirational Quotes and a Weekly Message Directly from God. Our Mission is to help spread Positive messages to as many people as possible. We love God and people who are kind. If you ... See More will stay in faith, your dream will not only happen sooner than you think, it will be bigger than you imagine. We Love Spiritual Motivation, Inspiration, Faith & Random Quotes By Joel Osteen, Eckhart Tolle,Pema Chodron,Chanakya, Neale Donald Walsch and other people of inspiration. Please join us and share our positive values. Inspiring conversations behind how people grow business, movements, ideas & civic grace. 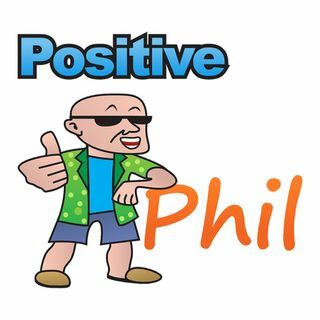 Positive Phil is a portal dedicated to sharing inspiring and positive news from around the world. Engaging interviews with famous people, celebrities, athletes, authors, spiritual educators, thought leaders, as well as others in the social, ... See More business and entertainment industry. Follow Positive Stocks for investment news, expert views, insights & commentary. ... See More Positive Stocks is a capital market services & financial communications firm in San Diego California with a proven track record of positively identifying and launching quick-coverage of highly potential small cap & mid cap stocks at an early stage. Meet the CEO's of some of the most ambitious small cap public companies and influencers within and around the industry.